Asian-inspired grill house Coriander Leaf Grill will be hosting a wine dinner on Thursday 28 September 2017 at 7pm featuring the wines of New Zealand’s Awatere River Wine Company. 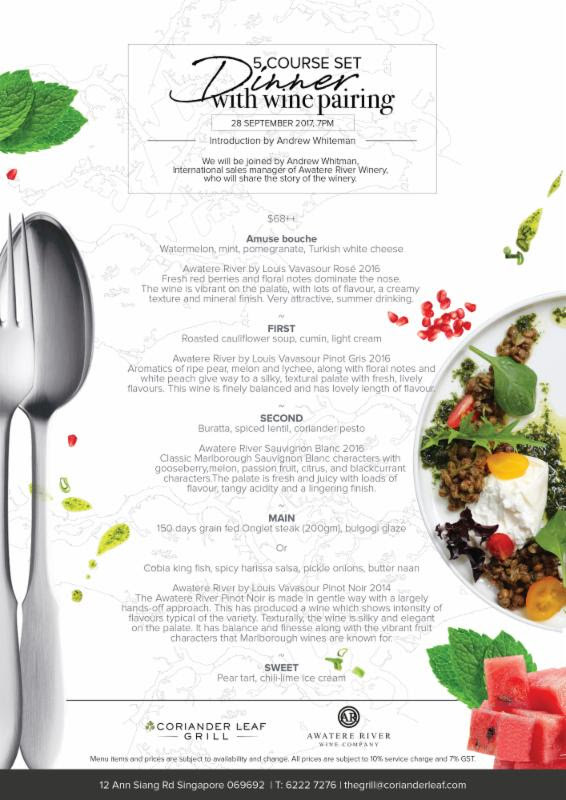 This 5-course wine pairing dinner will see a spread of charcoal grilled dishes with Asian influences paired with the wines produced in the Awatere valley subregion of Marlborough on New Zealand’s South Island. Awatere River Wine Company’s international sales manager Andrew Whiteman will take diners through the winery’s story, as well as a tasting of its wines such as the Awatere River by Louis Vavasour Rose 2016, the Awatere River by Louis Vavasour Pinot Noir 2014, and the highly-rated Awatere River Sauvignon Blanc 2016. This wine dinner costs $68++ per person. To book a spot, call 6222 7276 or email thegrill@corianderleaf.com.